The experience of your customer begins well before they walk into your building. In fact, their perception of your business is often formed while they are in their car. Perhaps they are listening to their GPS, while scouring the street attempting to locate your business. Alternatively, they may inadvertently see your business sign while shopping or running errands. Either way, it’s important to have a sign that impresses these individuals. A great sign instills confidence in the potential customer, and guides them to investigate your services. At New Style Signs, we make that first experience memorable. Just like a lighthouse steers a ship through the fog, a bold pylon sign helps customers find you. At New Style Signs, We customize our fantastic selection of pylon signs to suit the needs of your business. Our catalogue consists of specialized features including an illuminated acrylic face, dimensional and vinyl lettering, and doubled-sided signage. We make all of our signs user-friendly and easy to maintain. Pylon signs are fitting for businesses that need to broadcast their brand from a long distance. With the right sign, your company’s name and logo can attract the traffic driving to and from your location. These signs create practical landmarks that allow new customers to find your location, and feel a sense of confidence. After all, great signage reinforces the customers decision to work with you! 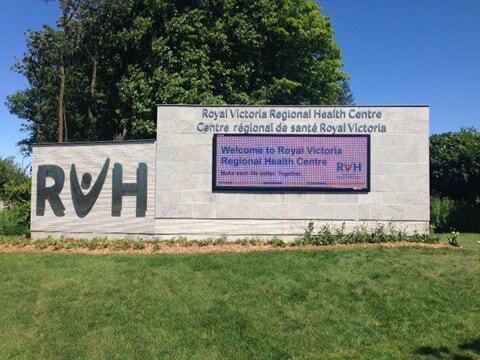 New Style Signs has been manufacturing and installing signage in the greater Toronto area for over 50 years. Our team of experts are extremely experienced and knowledgeable. We offer a variety of pylon signs to Mississauga schools, churches, businesses, and government agencies. We’ve customized and installed signs for local companies and municipalities such as the Ford Motor Company of Canada Limited, and the Hamilton Police Department. There is no company that’s too big, or too small! Call us today at (905) 363-0101 for a free estimate. We are happy to help you. Looking for more information? Browse examples of our pylon signs below.